Last night, after a stunning episode of Mad Men* that left me with my jaw on the floor, I decided to tune into MTV to catch some of the Movie Awards or whatever they are. I kind of half-watched Jennifer Aniston tell me how awesome it was that she got to be evil in Horrible Bosses (a movie that inspires a ridiculous amount of rage in me, but I’ll save that for another day) and win an award for it. Then there were a few awards and a guy from The Hunger Games or something. Eventually, out comes the “best kiss” category. Oh, Ron and Hermione’s kiss from Harry Potter and the Deathly Hallows Part 2 is nominated? No contest. …but then they called out the actors from Twilight Breaking Dawn Part 1 and I shut the TV off and went to sleep. 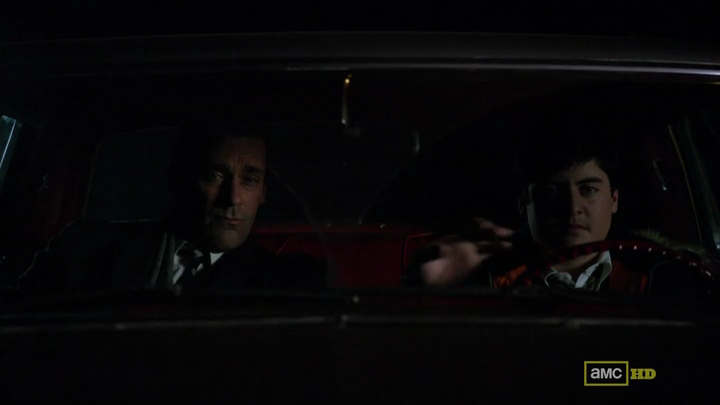 In other news, Mad Men was amazing and terrifying and devastating all at the same time. Not all was lost on cable that night. Yes, that is that creepy kid named Glen Bishop. I’ve seen this going around WordPress, and I’ve been nominated by three lovely bloggers for the award! Thank you to Smartfashioned, Opinionated Duck, and Savanah, Pro Se for the nomincations. Put the Versatile Blogger Award picture in your post. 1. Thirty Four Flavours An awesome gal from Toronto who blogs about fashion, music, and once sent me a letter with a royal wedding stamp stuck to the front. Pretty great in my books! 2. The Adventures of Transman A great collection of humourous and truthful posts about navigating the world as a trans male who has recently begun the transition process. Really eye-opening and a great read. 3. La Petite Végétarienne A blog that combines adventures in France with vegetarian food? Perfect! Seven random things about myself? Are you sure you want to know? Okay. 1. I prefer earl grey tea to coffee in the morning every time. 2. I have an elderly dachshund border terrier mix (we think, he was a stray pound rescue) with an attitude, but I love him. 4. I secretly really enjoy Coronation Street and I’ve been kind of half-watching it with my mom (the ultimate fan) since 3rd grade. 5. I can never find appropriate shoes for whatever I need them for. I’ve gone to farms wearing flats and I always find myself wearing boots when it’s 10c outside. 6. I wish I liked Oreos. 7. M*A*S*H is one of my favourite shows. ever. That concludes this award post! I would like to thank my MacBook for not dying and my lovely Rogers internet for not being a little b*tch. Thank you, thank you.